After giving the website a brand new look and adding some new products, Pear Educational Products is having a Grand Re-Opening! In celebration, I'm offering a giveaway package with a sampling of our lapbooking products. Designed specifically for lapbooking, the supplies at Pear Educational Products have several features to make your final lapbooking and notebooking projects extra special. The Fold-Up Project Bases come are made of heavy card stock and come as a 3 or 4 panel folder. Double scored folds allow you to stuff your lapbooks full of learning goodies and easily close flaps. Not only does the clean white background look nicer and give more options, but the working area is a much larger than standard manila folders. The Project Base Adhesive Strips are our innovative solution for easy storage in a 3-ring binder. Strips come with mylar reinforced holes and a heavy-duty ahesive strip with peel-away backing. Simply peel and adhere to the back of your lapbook. Non-adhesive side can be colored or decorated to match your lapbook. No more using ugly duct tape for 3-ring binder storage! Our spiral-bound Blank Project Books, also made of heavy cardstock, come in three different sizes. Our 9 1/2 x 11 and 12 x 12 books are made of 14 sheets, plus an additional page with a pocket on the front and back to store extra pieces. This is enough for 26 usable pages inside and a front and back cover to customize. Our 6 x 8 book is 16 sheets - enough for a front and back cover and 30 usable pages to fill with memorable learning material. This smaller size is great for younger children. On all of our books, the spiral is larger than a standard notebook, allowing for expansion of the overall thickness when items are added to pages. There are numerous ways to enter. Be sure to leave a way to contact you should you be the lucky winner! 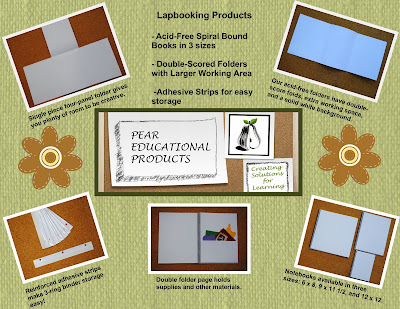 Mandatory Entry: Visit Pear Educational Products and tell me which is your favorite product (lapbooking or otherwise). For additional entries (leave a comment for each). Post about this giveaway on your own blog, Twitter, or Facebook. Please specify which in your comments (3 entries each…please leave 3 comments for each post!). 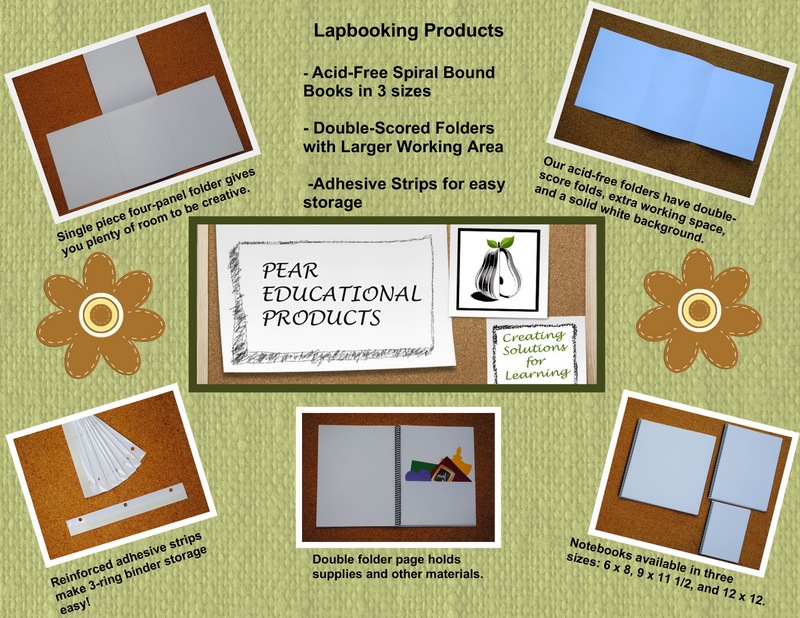 Like Pear Educational Products on Facebook. Follow Pear Educational Products on Twitter. Subscribe to Pear Educational Products’ blog via email. 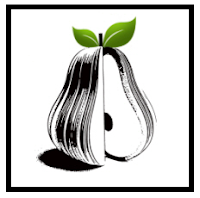 Subscribe to Pear Educational Products’ blog via a reader. This giveaway will end on November 18th at 6 pm EST. Giveaway is open to U.S. residents ages 18 and up only, void where prohibited by law. Winner will be selected by a random number generator at random.org. No purchase necessary for entry. The number of eligible entries received determines the odds of winning. If the winner does not respond within 48 hours, another winner will be selected. Quick...what do monster trucks and George Washington Carver have in common? They are both topics covered on DVDs by Marshall Publishing! You (or your kids) may already be familiar with some of Marshall Publishing's AS SEEN ON TV product lines covering topics such as jets, trains, fire trucks, and yes, monster trucks. What you may not realize, however, is that Marshall Publishing also has a number of award-winning historical and educational DVDs. Of these, I received George Washington Carver: His Life and His Work for review. Recommended for grades 8-12, this 30-minute DVD covers George Washington Carver's life from his beginnings in slavery through his final years at Tuskegee Institute in Alabama. The story of Carver, with his perseverance and insatiable appetite for knowledge, is sure to be inspirational to all who view this DVD. George Washington Carver: His Life and His Work begins with quotes of Carver while various still pictures and short clips are shown. This style continues through-out the DVD, with the narrator taking the viewer through the various periods and accomplishments of Carver's extraordinary life. My 7th grade son and 9th grade daughter both watched the DVD. My son briefly studied George Washington Carver about 6 months ago, and thought the DVD was a great review with some new information, too. My daughter, who is currently studying U.S. history, said it was informative and interesting, but the found the accompanying visual presentation just ok. While definitely not boring, it isn't a presentation with a lot of flash. Even if this isn't your student's style, the narration is quite good and enough to maintain interest alone. I personally found the photography, clips, and musical score to be a nice compliment to, while not detracting from, the narration. A study guide with discussion questions is also available at the website under the product description. This documentary style and approach, however, probably won't appeal to younger kids. While the DVD is recommended for grades 8-12, I'd say that kids as young as 4th or 5th grade would probably enjoy learning about George Washington Carver in this format. George Washington Carver: His Life and His Work is the type of educational resource that I would hope to see on the shelves of my local library. It would be a nice addition to a homeschool co-op library or a personal library as well. Be sure to visit the Marshall Publishing website for more educational titles. 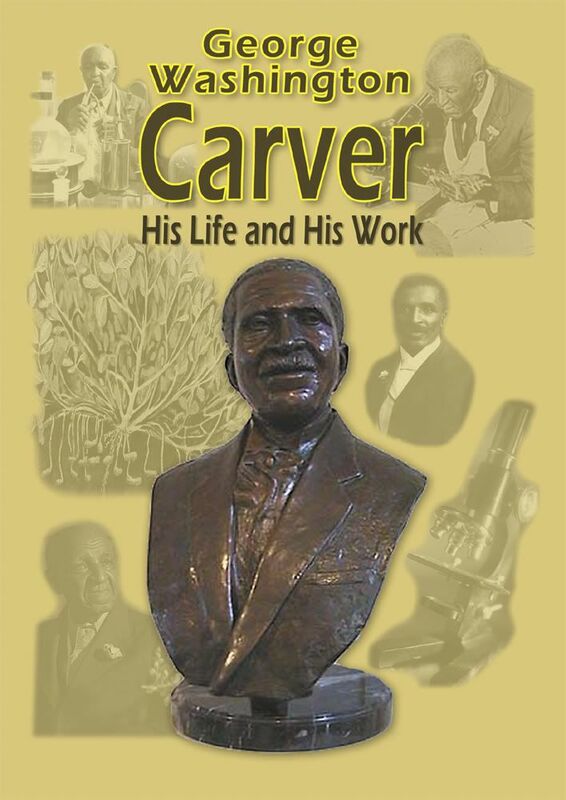 George Washington Carver: His Life and His Work is regularly priced at $24.94, but is currently available for a web sale price for $19.95. If you use coupon code TOSC1, you will also receive an additional 15% off this title. And while you are at it, add a DVD to learn about monster trucks to your shopping cart, too! Read more reviews of this product by visiting the official TOS Crew blog! When our family sits down to play a board game, it is usually a spur of the moment thing. Often that moment is late in the evening, which rules out long strategy games or games with complicated rules and directions. We also have some variances in ages and interests, so the selected game needs to be broad enough to appeal to all. Sometimes it is a bit difficult to find a game that fits that criteria. One that does, however, is Say Anything Family Edition by North Star Games. Last year I reviewed Wits and Wagers, also by North Star Games, which was a hit with our family. I was curious how Say Anything Family Edition would fit with our family. The game is very easy to learn how to play. It only took me a minute to explain the rules to the other players. Each person is given a Answer Card, a Dry Erase Pen, and two colored Player Tokens. Players take turns being the Judge, who is given a SELECT-O-MATIC 6000 (a small cardboard selector with a pointer) and question cards. The Judge reads a question from a card, and the other players write an answer and put it in the middle of the table. Answers should be written with the opinion of the Judge in mind. Once all answers are down, the Judge selects his or her favorite answer on the SELECT-O-MATIC 6000, keeping it from view. Then, before revealing the selected answer, the other players place their tokens on the answer card that they think the Judge selected. Players do not need to play their token on their own answer nor do both tokens need to be placed on the same card. Once the tokens are placed, the Judge then reveals his selection. Points are awarded to those who placed tokens on the selected answer, to the person who wrote the answer, and to the Judge for tokens placed on the answer selected. After each person has had a turn playing Judge twice, the game is over. The winner is the person with the most points. Simple, eh? Which superhero outfit looks the most uncomfortable? What would make the worst stuffing for a mattress? What would be the best monster to be? What company would I most want to work for? Who was the most important person in history? However, my family somehow managed to come up with silly or unique answers even for these types of questions, which entirely added to the fun. Also, a bit of knowledge about the other players is not only helpful in coming up with an answer that appeals to the Judge, but also can cause a race to get a particular answer first because the rules state that there can’t be duplicates. For example, the question below came up while my daughter was Judge. Which celebrity least deserves to be a celebrity? Knowing my daughter despises Justin Beiber, my son and I had a race to get his name written down on the answer card and placed on the table. My son won the race, but then my husband came in with the answer my daughter actually selected (Lindsay Lohan), making us both groan at our loss. While knowing the other players well gives opponents the ability to customize silly or serious answers for the Judge, I also think Say Anything Family Edition would be a great game to act as a great ice breaker and get to know others a bit better. I’m tempted to bring it to our next Mom’s Night Out and see what sort of crazy things come up. Overall, Say Anything Family Edition is a great game that is easy to learn, can be played by a variety of people at once, and is just plain fun. Say Anything Family Edition is recommended for ages 8 and up and for 3-6 players. It retails for $19.99 and can be purchased at local and online retailers. To learn more about this game and others by North Star Games, as well as find a store near you, please visit the North Star Games website. Have you ever dreamed of living in another time? As a kid, I used to watch “Little House on the Prairie” on TV and wish I could be Laura Ingalls. Who am I kidding? I still do. The idea of living in a “simpler” time, one where people lived on the land, self-sufficient, has always appealed to me. That’s why Running Out of Time by Margaret Peterson Haddix (Simon & Schuster Books for Young Readers (February 1, 1997; $5.99) was so attractive to me. The premise of the book is fascinating. Thirteen-year-old Jessie lives with her family on a frontier village in Clifton, Indiana in 1840....or so she thinks. When children start suffering from diphtheria, her mother secretly reveals that they actually live in 1996, and the village is a tourist site. The tourists watch the villagers through one-way mirrors and cameras placed strategically around the village, and Jessie must escape to find help to prevent children from dying. How would a child who had lived her whole life in 1840 adjust to 1996? It was a fascinating idea. The first half of this science fiction novel is definitely intriguing. It forces the reader to view the modern world in a whole new way. Modern toilets are amazing compared to outhouses. Telephones, radios, and TV are strange. I remember my mother telling me once that when TV first came out, my grandma was standing in the living room alone, changing her clothes in front of the fire. When the TV anchorman came on and started talking, she jumped and rushed to cover herself. Then she laughed as she realized he couldn’t see her! As the book progresses, however, it takes a turn toward the dark side. (Spoiler alert! I give away the rest of the plot in this paragraph.) A man who unleashes the diphtheria on the village as a science experiment is trying to kill Jessie. Meanwhile, Jessie navigates modern-day Indianapolis and holds a press conference to draw attention to the children’s plight. She saves the day for most of the children (a handful of the children die), but ends up in the hospital with diphtheria herself and separated from her family. Meanwhile, all of the remaining village children are removed from their parents’ care and placed into foster care. The father ends up in psychotherapy and the village is broken up. While I greatly enjoyed the first half of this book, I was disturbed by the conclusion. Haddix may have thought that no other ending would be plausible, but I think the ending would scare many kids. To introduce the concept of being forcefully separated from one’s parents by the government would frighten some less sophisticated readers. Moreover, if you are a homesteader, you might want to avoid this book, as by the end, it portrays people who live a back-to-the-land old-fashioned lifestyle as “kooks.” Overall, I would give the book three stars (out of five), with a warning. The book states it is for readers 8 – 12 years old, but I would say it is geared toward the top of that spectrum, since there is the threat of murder, drugs (the villain tries to tranquilize Jessie with a sedative in her water), dying children, and encounters with social services. Though all of these themes are gently touched upon, they are touched upon nonetheless. These dark elements reinforce my desire to live in an earlier time. But I am reminded when we tent camp how immensely grateful I am to the men who invented indoor plumbing. After three weeks of less-than-exciting classroom time and 6 hours of driving practice with a very patient instructor, my daughter is heading to the Secretary of State to get her Level 1 license this afternoon. After the first two hours of instructional drive time, students are issued a pink slip to drive with a parent, so we've already experienced a few outings with her behind the wheel. 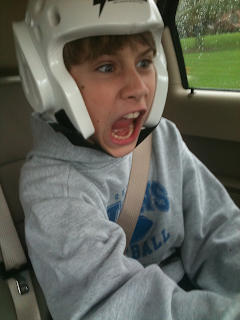 Our first trip was to karate class, when her little brother discovered another use for his sparring helmet. It was quite the adventurous ride. If you spot a cute, short blonde behind the wheel with slightly nervous passengers, I'd appreciate your kindness and sympathy. The last thing either of us needs is an impatient, tailgating driver behind us. So, much to my daughter's embarrassment, I've decided to announce our situation by adding a little bling to my car. Michigan roads, here we come! I'd like to welcome a guest blogger today, my 12-year-old son, as he shares his opinion on a book he's recently read. Everyone knows about dragons, huge beasts that can breathe fire. I never got interested in dragons until I read the book Raising Dragons by Bryan Davis*. This book is about two kids named Billy and Bonnie that find out that they’re dragons. They also discovered that dragon slayers, who swore an oath to the round table, are trying to kill them. What I liked about the book is it has a lot of commotion and conflict. It also has some Biblical references about dragons. There are also some verses and some Bibles woven into the story. For example, they were illegally smuggling Bibles into another country. Another example is Billy’s parents brought out their family Bible to show Billy verses. What I didn’t like is that the main characters got hurt almost every other chapter. It was very repetitive. I also didn’t like that the slayers thought that they were the Knights of the Round Table. Overall I give this book a four out of five stars and I think that grades sixth though ninth would like it because it has a lot of action. I wouldn’t recommend it to little kids because of the violence. Each time I sit down to meal plan, I print off a blank calendar for the month, and write in some standard meals, e.g. tacos, hamburgers, and spaghetti. Then I pull out my recipe books, review clipped favorites or recipes I’ve been wanting to try, and even surf recipe websites in an attempt to come up with enough interesting meals to fill in the rest of the days. It is quite the process that I often drag out over days, and I hate it. Absolutely hate it. I’ve thought about planning weekly, but feel it is almost better to take my suffering all at one time rather than endure it four times a month. So, I continue to go on as normal and fantasize about having a personal chef to both plan and cook for me. E-Mealz, which is recommended by financial guru Dave Ramsey, is a subscription service that provides a weekly meal plan and shopping list. The idea is that the service will save money in the long run by avoiding costly dinners out and planning meals around store sales. There are twenty-eight different meal plans are available. A list of meal plan options and samples are available here. The weekly plan includes ingredients and instructions for one meal a day, with suggested side dishes. How it works is fairly simply. Subscribers select a meal plan that suits their family. Once a week, a new plan is available on the website for download and/or printing. The entire plan is two pages, with the recipes on one page, and the shopping list on the other. E-Mealz isn’t a perfect system. A perfect system would be that personal chef that works for free. However, unlike my other options, E-Mealz is fairly practical. Easy recipes – There are no overly complicated recipes. Older kids could easily take over some of the cooking! Catagorized shopping list – Grocery items are listed in five categories: Deli/Produce, Meats, Dairy/Refrigerated, Frozen, and Canned/Bottled/Packaged. Meals specified on grocery list – Next to each item is a number that signifies the recipe that requires that ingredient. This makes tweaking recipes or accounting for items on-hand very easy. List of staples – At the bottom of the list are all the staples needed for each recipe. I often forget to check my supply on staples and get in a bind come preparation time. Variety – New meals are provided each week. Some recipes are cycled again, but only about every 5-6 months. Ease of use – Nothing complicated here. Simply print and go. This Poppy Seed Chicken dinner from the Any-Store meal plan was a hit with my daughter. Easy recipes – Yes, this was also in the “like” list. However, sometimes the recipes were too easy. One “recipe” was simply a purchase of precooked ribs from the deli with a can of beans and frozen french fries. Finding a plan – It was hard to tell if you’d like a plan from the sample menus. I was not happy with my first plan and switched after several weeks. Subscribers are allowed to change plans one time during a 3-month subscription. Needing to substitute – My family can be picky, and I definitely had to substitute some meals every week. I didn’t save on grocery expenses – I didn’t find a great cost savings. Many of the items were convenience or packaged items. Also, when I shop sales, I purchase sale items in mass quantity and stock up my pantry for maximum savings. This program isn’t designed to save that way. I would have preferred that my meal plan arrived via email rather than needing to go to the site to retrieve it. Despite some of the cons, I liked E-Mealz quite a bit. Yes, I had to substitute or tweak some meals, but it was easy enough to replace with an old stand by or leave out ingredients. With the grocery list items labeled with the corresponding recipe, it was quick to cross off items no longer needed when substitutions were made. And the time and fussing it saved…oh, my. One week was particularly busy and I desperately needed to get groceries, but with no real time plan. I grabbed the E-Mealz plan, quickly did a few tweaks, and headed to the grocery store while my son was at a sports practice. I had about an hour in the store to accomplish my shopping and did so easily. While E-Mealz didn’t save me a lot on actual grocery cost, it did save me time and sanity, both valuable things! I’m not sure that I would use a subscription service like E-Mealz indefinitely or exclusively, but I can definitely see using it to avoid cooking ruts, to help during very busy seasons, or to act as a starting plan to tweak. Sometimes I just need reminders of other simple recipes to use, rather than get stuck in the taco/hamburgers/spaghetti rut. At $5/month (purchased as a 3-month subscription at $15), even if I only put part of the plan to use, it is worth it to me. Plus, if I opt to not use the plan for that week, I can always download the plan and save it for another week and/or use the recipes that look promising from the unused week as substitutions for another. I plan to put E-Mealz on my Christmas list to extend my review subscription. There isn’t much I need as far as things, but I certainly could use some more time! To learn more or to purchase a subscription, visit the E-Mealz website. “I never thought it would happen to me” begins the book Small Steps. Isn’t that the way it always goes? We never think we’ll have to deal with illness, tragedy, or hardship in our lives. But unless you live your life in a bubble, at some point, “it” does happen to you. And then what...? It is what happens next that separates the wheat from the chaff. Will you take on the role of victim or victor? Peg Kehret, author of Small Steps: The Year I Got Polio (Albert Whitman & Company, January 2006; $10.85), chooses to be the victor. This superb autobiography describes how Kehret survives and, eventually thrives, despite becoming almost-fatally infected with polio at twelve years old. In the fall of 1949, Kehret contracts polio, and ends up quarantined in the hospital for months. It is a story of compassion, triumphing over adversity, and finding joy in everyday experiences, as Kehret moves from hospital to hospital, meeting other polio-stricken children and caregivers on her rehabilitation journey. The book is written chronologically, with few flashbacks, which makes it easy to read, even for reluctant readers. While there is some difficult vocabulary as it relates to polio, all of it is explained in everyday language. The book is ideal for students in grades 4th through 9th, though younger advanced readers may be able to read it as well, as long as parents don’t mind having youngsters tackling the concepts of paralysis and the threat of death. If you have a student who is interested in medicine, she will love this book. This autobiography brings to life our country’s not-so-distant past when it was not uncommon for children to die before reaching adulthood. I remember my grandmother talking about polio, and how every afternoon she had forced my father and the neighborhood children to take a nap in her living room. She was proud that none of them contracted polio and attributed it to strengthened immune systems from her daily nap ritual. Small Steps reminds readers of the miracles of modern medicine and the fragility of human life. The book includes black-and-white photos of Kehret, her roommates, doctors, and polio researchers, as well as back matter describing polio and efforts to eradicate it, resulting in Jonas Salk’s vaccine. I highly recommend Small Steps and rate it five stars (out of five). Kehret becomes stronger through her trials and is an inspiration to all of us who have had “it” happen. Does your student desire to have a career in business, or aspire to own a business one day? If so, basic marketing knowledge will be valuable in working toward his or her goals. Professor in a Box has recently released Principles in Marketing, a college-level marketing course for high school students with an interest in business. Students completing this course will also be prepared for the CLEP Principles of Marketing Exam. Suitable for any high school level student with basic reading and math skills, there are no prerequisites for this course. In Principles in Marketing, Dr. Julie Pirsch, Ph.D. covers 19 chapters of typical introductory marketing material in 28 lessons. The course can be completed in a semester with 2 lessons a week, a standard college pace, or in 28 weeks at 1 lesson a week. The lectures are presented as flash lectures, in 1-2 parts, with 10-20 slides each. The students are presented with audio of the professor that correlates with the self-advancing slides. Each lecture is approximately 30 minutes long. You are able to sample Chapter 1 in its entirely to get a feel for the style of the instructor and presentation. I felt the content and delivery of instructor was fairly typical of a first year college-level marketing course (and I’ve had a handful of marketing courses in my day for good comparison). The instructor was easy to listen to and follow. While I would caution that if your student isn’t ready for a lecture style presentation, you might want to wait a bit for the course, it is also a great exposure to a formal lecture style course that students might see the first year of college. This is a completely independent course and extremely easy to use. There is no textbook to read and students simply watch the lecture, spend some time reviewing the lesson’s concepts, investigate online resources by chapter, and take the quiz. Each lesson has a multiple-choice quiz, which takes about 15 minutes to complete; there are also 3 exams for the course. I can’t say my daughter loved the course, but she felt the presentation and method were fine and it would certainly be manageable to carry through to the end of the course. Given that it is an introductory course on a topic that is much more exciting when studied at higher levels, I wasn’t exactly surprised she didn’t die of excitement over the course. One of the very reasons to take such a course that prepares for the CLEP is so that you can test out of it for college and move on to the more exciting material! She mentioned that she liked that you could watch lectures whenever you wanted, unlike the numerous live online classes she’s taken. From this I gathered that she felt the course lectures had a class feel, rather than learning from a book, or watching a course on DVD. It would have been nice if the quizzes and exams had some sort of record keeping ability. The student is told whether an answer is correct or incorrect when each individual answer when submitted, then given a overall grade at the end. 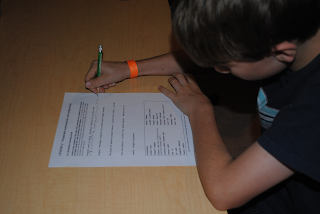 Then the student has the option to go over the quiz and review selections and answers. However, once exited, a record of those answers are not kept; the student needs to record the score before leaving the quiz. There is a positive that the quizzes and exams can be taken over and over for review without evidence of previous answers. At first I wasn’t sure about the lack of a textbook and I was worried about the course being thorough enough. This was an unfounded concern. Then it occurred to me that I never actually read much of my marketing textbook in college, mostly because the material was covered again in the lecture. Rather than Principles of Marketing lacking with a lecture-only format, it is simply efficient. Overall, efficient - and thorough - is how I would describe Professor in a Box’s Principles of Marketing. It gets the job done as an introduction to marketing and preparation for the CLEP exam. 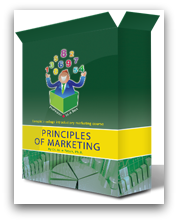 Principles of Marketing is available from Professor in the Box for $119.99. If you aren’t happy with the program after working through the first 3 chapters, it comes with a full money back guarantee. Professor in a Box also sells a Financial Accounting course that may be of interested to your future entrepreneurs. While the pain of every survivor is individual and personal, many Holocaust memoirs relate similar tales and situations. The Seamstress by Sara Tuvel Bernstein with Louise Loots Thornton and Marlene Bernstein Samuels (Berkley Trade, 1999, $10.88) is different. First, it covers more of the author’s life than most memoirs, including her childhood and adulthood long after surviving World War II. The reader is able to see the contrasts of her life before and after the war, as well as how the war changed the trajectory of her life. Secondly, Seren Tuvel is a Jewish girl from Romania, a part of Europe that is rarely discussed in Holocaust memoirs, though it was equally touched by the war. Seren, who is a teen when the war begins, uses her talents as a seamstress and her cleverness to stay alive from her time in her home village near the Carpathian Mountains to Bucharest to Budapest and, eventually, to the women’s work camp Ravenbruck in Germany, near Berlin. The book would provide a good starting point for a study of European geography. Lastly, this story is one of hope and determination. It is inspiring to see how one woman’s sheer willpower kept her and her companions alive despite starvation and deplorable conditions. Berenstein tells her story in a straightforward, practical manner, without hatred or bitterness. The only criticism I have of the book is that time is not more clearly marked for the reader. It would have been helpful if every chapter would have started with the month and year of that portion of the narrative to give the reader a reference point. The book includes several black and white photographs, scattered throughout, which is nice. Berenstein’s co-author and the president of the World Jewish Congress provide two introductions and Berenstein’s daughter pens an afterward. These can be confusing and might be better read after completing reading the main narrative. There are two maps included: Europe in 1923 and again in 1942. It is an enlightening comparison! While the book was voted one of the American Library Association’s “Top Ten Best Books for Young Adults,” this book is not for children. It contains brutal violence, death, and suffering. Although the violent scenes are not described in a vivid manner nor dwelled upon, I would discourage parents from giving it to any child under 14. It is an excellent book, and I highly recommend it for a mature high school student or an adult. I would include The Seamstress among my all-time favorite books (and I have read a lot, so this is high praise). I give it five stars (out of five). Tuvel teaches by example: “Always be prepared, always plan ahead, anticipate, be ready, don’t depend on anyone but yourself, be inconspicuous, be observant, and always stay alert.” Good advice in a dangerous world. Can You See Your Brain When You Do That? My daughter started Driver's Ed last week (which has brought up numerous feelings of feeling old, but that is a different blog post...) and has gotten a little taste of your typical high school classroom. The kids are unengaged, with glazed-over eyes, and really don't want to be there. I get the impression that the same applies to the teacher as well. While this is typical (I don't remember having an overly engaging Driver's Ed teacher, do you? ), it is a newer experience for her. She doesn't want to be there either and basically has the attitude of putting her time in so she can get that Level 1 license. While I have heard lots of murmurs of dissatisfaction on the situation from her, the main theme has been comments about homeschooling in the classroom. The very first class the instructor asked who *didn't* attend the local high school just next door. Only my daughter and one other homeschooler raised their hands. When he asked where they attended and they replied that they were homeschoolers, he sighed and rolled his eyes. Nice, eh? Originally, I gave him the benefit of the doubt since when telling the story, my daughter said she and her friend replied with a "We are both homeschooled," precisely *in unison*, and I thought that prompted the eyeroll. However, there have been multiple comments since, like the story of how the instructor knew a homeschooled student that was only "homeschooled" so she could babysit her younger siblings, or the homeschooler who worked at Wendy's all day. Seriously? My daughter exerted great will power and held her tongue, which at times isn't as restrained! On another occasion, even another student got in on the 'tude about homeschoolers and made a comment under her breath. "Just because we don't go to the same school doesn't mean we don't *do* school!" The assumption that she had no schoolwork over the weekend was entirely laughable. Her current studies include all honors, AP, and college courses. My daughter now talks of creating a community awareness program where she goes into the public schools and gives presentations about who homeschoolers really are. Ok, she's not really serious, but it is a fun fantasy. Can you tell I have a justice seeker in my house? If the comments continue, I'm afraid there might be an impromptu presentation right there in Driver's Ed! It is a shame that homeschoolers have to continuously battle stereotypes wherever they go. Whether or not a student is homeschooled is entirely irrelevant in Driver's Ed. I'd just like to say to the instructor, "Can you see your brain when you do that? If so, I suggest you use it!" I sometimes get caught in a rut and focus only on the 3 R’s, neglecting topics that may fall in the fine arts or other area. Making way in the schedule to study something that doesn’t fall within the basic skill set needed as an adult is sometimes difficult, especially if your student is struggling with things like writing a decent paragraph or other necessary skills. After all, some may reason that writing skills as an adult are more important than knowing whether Bach was from the Baroque or the Classical period. If only there were unlimited hours in the day with which to learn! My other obstacle is *my* time. Not only am I often lacking knowledge in such areas, I don’t have time to put something together. Those homeschool moms that “just put together a study” on whatever subject you’ve always wanted to know more about, happily scouring the internet, creating timelines from scratch, and creating thought-provoking questions and activities always awe me and make me want to send my deprived kids to their house! I realized I didn’t have to after receiving A Young Scholar’s Guide to the Composers by Bright Ideas Press. This program is a study of music for homeschoolers, regardless of previous knowledge of the subject. Everything is done for the busy (and intimidated) homeschooling mom. Furthermore, each lesson is completed over a short days three days a week. A Young’s Scholar’s Guide to the Composers includes 32 weekly lessons covering 6 periods of music and 26 composer biographies. The first few lessons cover give an overview of the Ancient through Baroque periods. Once a broad understanding of the early periods is obtained, focus on particular composers starts with Lesson 4 and the Baroque period. The composer lessons are grouped and studied according to the period. This program is intended for grades 4-8, but is very adaptable. In fact, while I used it with my 7th grade son, I already have some materials on my shelves that would be a wonderful supplement to make it a comprehensive high school course for credit for my high school daughter. The Appendix also makes many suggestions for resources to explore, including books, CDs, DVDs, and websites, as well as gives ideas for games and folderbooks (simplified lapbooks). Day 1: read-aloud, note-taking or student review, listen to music (links provided). The student pages are all provided. The lesson/read-aloud takes about 15 minutes to read. Students can also read this to themselves. Day 2: timeline, map work, and composer info card, listen to music again. All of the prep work is done for you. 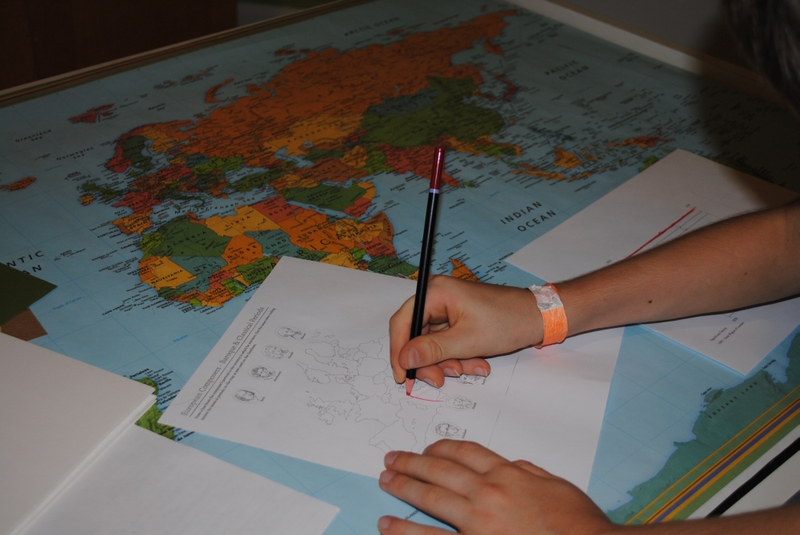 This is hands-on work and mostly involves highlighting lines, drawing a line from a picture to a map location, and using provided graphics and prompts to complete informational cards. Day 3: listen to music selections again. As noted, links to music selections for each lesson are provided, along with questions and things to which particular attention should be paid for each piece. The music selections, graphics, timeline and map printouts, glossary, answer key, and other supplemental resources are all provided in the Appendix. While I see this is a very organized way to do things (e.g. all composer graphics together), I would have preferred to have some of it right within the lesson. The lesson portion includes the reading and the student or note-taking pages. The schedule information and hands-on instructions and printables are located elsewhere. For the map work, students draw a color-coded line, which correlates to certain periods, from the composer to the country. We’ve never done a study like this and I was pleasantly surprised at how much my son seemed to enjoy it. 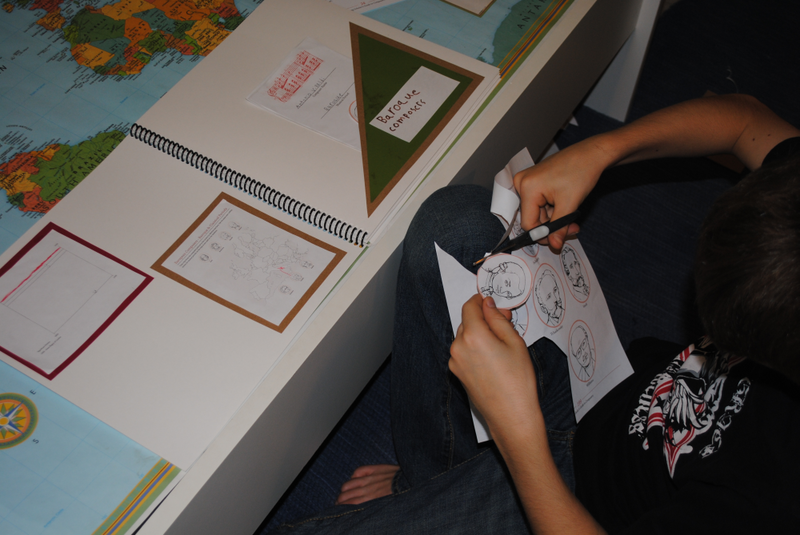 I had him complete the note-taking pages while I was reading, which helped him maintain focus on the material. I thought he might not want to listen to the selections, since they are much different from his preferred music, but this was not at all the case. For the hands-on component, we decided to use a blank spiral book, that will keep all of the composer information, in one place rather than individual folders. I was shocked at how into the cutting, pasting, and deciding on the design he was. Truly shocked. I am heavily considering more hands-on work in his studies. We reduced the size of the timeline and map so they would fit on one page. Composer cards are kept in a pocket on the opposite page. Terms, designs, mini-books and more are planned to fill in the pages. At the end of the study, the completed notebook will be a great review and memory of the study. Overall, I thought A Young Scholar’s Guide to Composers was very nicely done and made this normally stick-to-the-3Rs mom want to branch out a bit. It just took a snippet of our week and was extremely easy to execute with everything at my finger tips. My son has really enjoyed this study, and I have too. 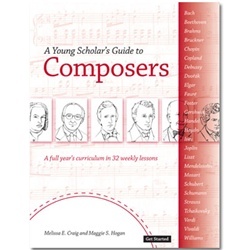 A Young Scholar’s Guide to Composers is available from Timberdoodle. Visit their website or request a free homeschool catalog to browse other products. Disclaimer: As a part of Timberdoodle's Blogger Review Team. I was provided this product free of charge in exchange for my honest review. I have received no other compensation. I strive to give a balanced overview of each product, detailing my opinion of both pros and cons and how the product worked for my family. What works for one family may not work for another. I encourage you to research sufficiently to determine if any product will be a benefit to your homeschool. I love carpools. It makes no sense for several busy homeschooling moms to all be driving to the same location if it isn't necessary. My kids are actually able to participate in more activities because of carpool arrangements. Carpools save gas, they save time, and they save sanity. But it is a sure sign that we moms can overschedule when even the carpools can get a bit crazy. Below is a true happening. Real names are not used in order to protect the insanely self-inflicted over-scheduled innocent. Mom A is scheduled for a football carpool required to get Child A and Child B1 to practice. However, Mom A would really like to go to a special dinner event, and asks Mom B if she wouldn't mind switching carpool days with her. Mom B is quite willing to switch, however, Child B2 has a special evening activity and if Mom B drives to football, Child B2 won't have a ride. So, Mom B asked Mom C, whose Child C2 is attending the same event, if she doesn't mind picking up Child B2 for her event, so she can take Child B1 and Child A to football practice, so Mom A can go to her dinner. Mom C certainly doesn't mind picking up Child B2. However, in order to do so and not make both Child B2 and Child C2 late for the event, she needs to make sure that Mom D can drive Child C1, who needs to attend a play rehearsal with Child D. If Mom D can, Mom C can then pick up Child B2 and take her to her event with Child C2, so Mom B can take Child B1 and Child A to football practice, so Mom A can attend her dinner. Luckily, Mom D can drive, so Mom A can go to her dinner. That means that all will go smoothly among the four moms and six children all needing to be at four different events at the same time. Whew. All is well and another evening of carpooling has been accomplished. Hillary Clinton has it wrong. I don't need a village to raise them; I just need a village to get them to their activities! Can I just start this review off by saying that I am not a scrapbooker so you know from where I'm coming? I do like the concept, and have even tried it a time or two. However, there are a few things that get in my way. The cutting. The pasting. Actually having printed photographs. Ever since I went digital with my photographs, I rarely get them printed. If I do, it is for a particular purpose (e.g. the annual framing of photos for grandparents at Christmas), rather than to put them in some sort of order for viewing. Instead, they remain on my computer's hard drive with good intentions. I had heard of digital scrapbooking before, but really didn't think I had the level of creativity that would be needed, not to mention the time to get down the learning curve of the software. So, I left it at something that is a great idea - for other people. When I was given the opportunity to review some new digital scrapbooking software, My Memories Suite, the wanna-be-scrapbooker in me took over. I really wanted to give it a try, fully recognizing that I might when all is said and done, I still think it is a great idea for others, but not me. This was new territory with an unknown outcome. My Memories Suite is a downloaded product, though you can purchase a CD back-up if you'd like. The download and installation process went smoothly. When I opened up the program, it was pretty straight-forward and intuitive. This is a good thing, since I tend to not bother to read instruction manuals. When creating a new file, users are given the option to select a template or create their own. I started off with the template option. There are over 30 templates already preloaded. Some of them have a theme already, others are more customizable with your own selection of background papers and colors. Of course, text, shapes, and embellishments, and can be added as well. Even video, music, and narration can be added to the pages for a more interactive scrapbook. Additional pages, templates, and embellisments can be purchased from My Memories, and there is also a selection of free products to download. I think I fared pretty well. The only real problem I had was finding some of the items I downloaded from the site. They landed in areas and files of the program I didn't expect, and it took a bit of hunting around at first. I didn't make a full scrapbook, but I did make some single pages. I have to admit, it was much easier than I anticipated. I've tried creating similar items in graphics programs in the past and more often than not ended up frustrated. 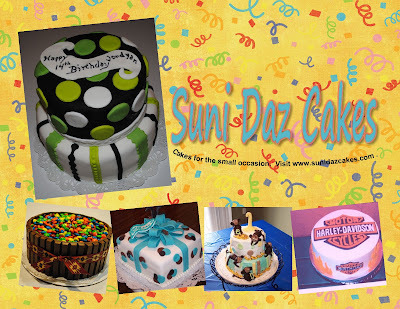 My first attempt was a page that showed off the various birthday cake creations of my husband's mom. This took no time at all. I simply pulled the pictures into the template, selected a festive background, and added a bit of text that matched the colors of the background. After seeing how the basics worked, I decided to play around a bit more and opted to create my own page, rather than use a template. This time I created a display page for some of the lapbooking products available from our family business. Sizing, moving, rotating, and framing the pictures was a breeze. After a textured background, some flower embellishments, and text, I was done. When this is an 8 1/2 x 11 as intended, the text is more readable. One thing I've attempted before on a graphics program is a simple photo composite. I've needed to do these in the past for my daughter for theater opportunities. Though I've managed, it has never been as easy as the one below. This one was a template. I just selected three photos and a background. I did adjust the size of two of the photo areas so it didn't crop as much from the original. 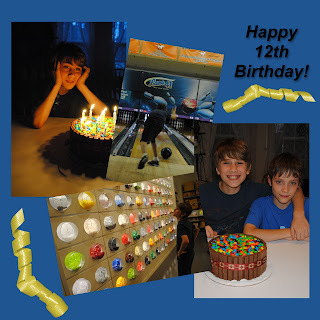 My last project was more like a traditional scrapbook page and documented my son's last birthday celebration. I got "fancy" on this one by adding and positioning/rotating some embellishments. I imagine there is a lot more that can be done with this program, but I didn't think the above was too bad for a first try. Check out the Page Gallery on the My Memories website for better ideas of what can be done. Wow! There are some great pages to see there. I'm looking forward to playing around some more, especially with the interactive features, like adding video and audio to the pages, or creating a complete themed scrapbook. There are a variety of ways to share your creation, including exporting it as a jpeg file, getting it printed as an album, printing on your own printer, or burning to a DVD. You can easily share with friends and family or make a special scrapbook as a gift. Overall, I liked My Memories Suite quite a bit and can now see a place for digital scrapbooking, even for me. The program was fairly intuitive, and I liked that the products that you can download (either purchased or free) can also be used in other graphics programs. Of course, as I mentioned earlier, finding some of those products was a challenge at first, but I figured it out soon enough. Also, I couldn't find a way to make the pages a size that wasn't standard (e.g. 8 1/2 x 11, 12 x 12, or 8 x 8). There may be a way to do this, but it wasn't obvious. Regardless, I can do this type of scrapbooking. No cutting, no pasting, and no printed photographs required! Now, I have two bonuses for all of my readers. I have a coupon code that will give you a $10 discount off the purchase of the My Memories Suite Scrapbook software and a $10 coupon for the MyMemories.com store - $20 value!). Please enter code STMMMS53515 to get your discount. Secondly, I have a giveaway for one lucky winner who will receive a code to download the My Memories Suite Scrapbook software, a $39.97 value, for FREE! Giveaway Closed! Congrats to the winner, Sarah, comment #8. Visit www.MyMemories.com and click "free kits" in the navigation bar. Leave me a comment letting me know your favorite. 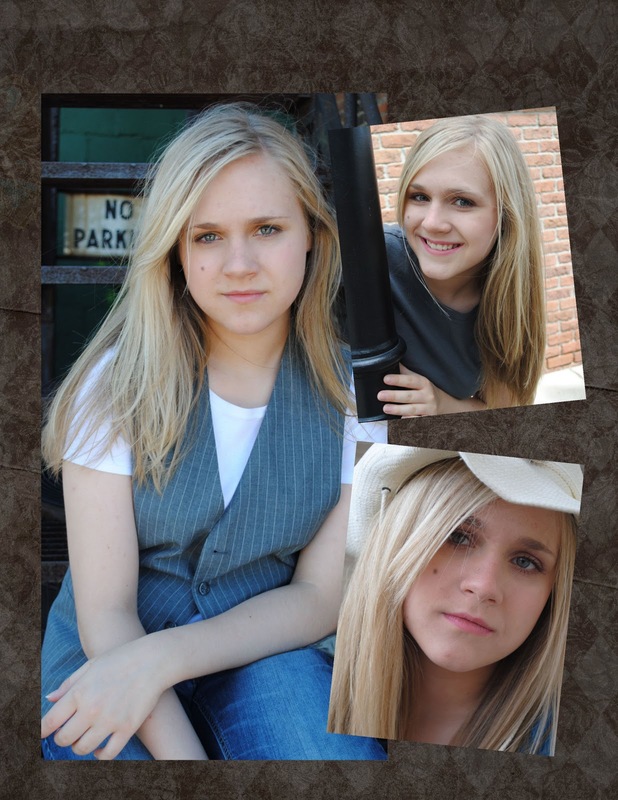 Follow My Memories via their blog, Facebook, or Twitter. One entry for each. The giveaway will end on October 21st at 6 p.m. EST and the winner will be chosen by a random number generator. Disclaimer: I was provided the product free of charge in exchange for my honest review. I have received no other compensation, though the given coupon code is part of an affiliation program. I strive to give a balanced overview of each product, detailing my opinion of both pros and cons and how the product worked for my family. What works for one family may not work for another. I encourage you to research sufficiently to determine if any product will be a benefit to your homeschool. Can you imagine what life would be like if you had to hide your whole life in one room? What if you could never go outside, never see the sun? What if your family couldn’t even mention your existence outside of your home? Luke Garner lives such a life. He is an illegal “third child.” Among the Hidden by Margaret Peterson Haddix (Simon and Schuster Books for Young Readers, 2000; $6.99) explores the idea of life after droughts and famines when, to ensure there is enough food for all, the Government outlaws anyone from having a third child. The novel’s premise is not so far-fetched, as adults will recognize China’s “one child” policy in the pages. This provides plenty of discussion fodder for parents and students. Who has the “right” to live? Does the Government have the “right” to dictate such intimate choices to families? How would you ration food if it were scarce? Among the Hidden is a compelling, page-turning science fiction novel about twelve-year-old Luke’s experiences on his family farm when the Government forces the family to sell their woods and the Government builds fancy houses for the rich, called Barons. But everything changes for Luke when he spies another illegal third child in the new Baron house next door. Among the Hidden is well-suited to 4th – 7th graders, though older reluctant readers would like it, too. The language and story are easy-to-follow. I would give the book four stars (out of five). The book reminds me of The Giver by Lois Lowry and the series that followed. Among the Hidden is not quite as good as Lowry’s book, but if your child liked The Giver, he will like this as well. The series continues in the following titles. Like most sequels, though, the serial books are not as good as the first title. However, for Shadow Children series fans, they do hold readers’ interest. Overall, they are unpredictable and action-packed. Among the Imposters – The series continues with Luke’s story as he goes to Hendrick’s boarding school, which has strange happenings and no windows. In the woods, Luke discovers other illegal third children. Four stars. Among the Betrayed – The point-of-view in the series shifts now to Nina, an illegal third child introduced in the previous book. This takes the reader to Population Police Headquarters and introduces three new characters: Alia, Percy, and Matthias, who are in jail on suspicion of being illegal third children. This is the weakest book of the series, as the danger is only perceived as being real by the protagonist, not by the reader, who knows the villain in this book is really a good guy. Two stars. Among the Barons – The series shifts back to Luke, who has taken on the identity of Lee Grant, a Baron child who was killed in a suspicious skiing accident. Luke lives among the Grants and their servants, trying to determine who is friend and who is foe. While this book will be well-received by those who like the Shadow Children series, it isn’t the best one in the bunch. Three stars. Among the Brave – The point-of-view in the series shifts again to Trey, Luke’s close friend from Hendricks, who is thrust into the role of an unlikely hero. It also brings Luke’s brother Mark in as a more major character. It is set in the new Population Police headquarters and surrounding work camps. Even though the adults come off as inept and cowardly, this is one of the best books because Trey is likeable and grows as a person throughout the book. Four stars. Among the Enemy – Matthias, one of the characters from the third book, takes over the narrative here. After the coup in the last book, Matthias ends up at the Population Police’s new headquarters in the Grants’ old house. He saves a Population Police officer’s life, and ends up as a favored “son” of the commander. Although the ending is a bit far-fetched, as is the fact that every crucial character lives within walking distance, it’s intriguing overall. It is a grittier book, with more death and danger, as Matthias’ life has been a hard one. It is a book about questioning one’s values and loyalties, with a lot of references to God. It’s another strong addition to the series. Four stars. Among the Free – The series concludes by returning to Luke’s point-of-view. However, Luke appears to have changed a lot in the interim. He is less confident, more defeated, and running scared. The book confronts a lot of interesting concepts about freedom and choices. What does it mean to be free? How can freedom with its wealth of choices be scary? It also confronts the possibility of trading one totalitarian regime for another. The concluding book wraps up loose ends well, though, in the case of Nina, Matthias, Trey, and the rebel adults, a little too neatly. It foreshadows the characters’ futures and is a satisfactory ending. Four stars. Latin is a subject that I always felt was beneficial to learn because it is not only the gateway to other foreign languages, but to English as well. However, I've always been intimidated by teaching it. Thankfully, there are many programs out there with plenty of teacher support and DVD lessons, even for the completely Latin-challenged homeschool mom. I've reviewed some of these in the past, and while many of them were decent programs, I haven't found one that was a fit for my youngest *right now* for a variety of reasons. The end result is that I have several programs on my shelves waiting for a potential fit in the future, with a lack of Latin studies in the present. When I had the opportunity from Timberdoodle, a provider of homeschool curriculum, to review Visual Latin, my first thought was that the readiness for Latin in my student simply wasn't there and perhaps I should pass it up. However, Visual Latin is a new program and the sample videos looked very interesting. Furthermore, this one for sure wouldn't end up taking space on my shelves because it is a download (DVD versions are also available). Visual Latin is taught by Dwane Thomas, who has been teaching Latin for 15 years. I'll share more on the instructor later. Two levels, Latin 1 and Latin 2, are available. For this review, I received Lessons 1-10 of Latin 1 in the download format. 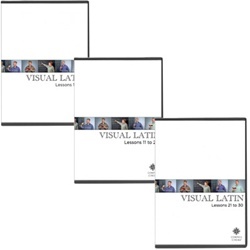 Visual Latin is a self-paced course and can be adaptable for a variety of ages and learning pace. The recommended age is 9 and up, and is designed for a pace of 20 lessons per semester, or 2 lessons per week. No additional texts are needed, though there are recommendations and suggestions of texts to use with the program to count it as 2 high school credits. By itself, Latin 1 could be counted for 1/2 high school credit, and Latin 2 for another 1/2 credit. The structure of the program is very simple. Each level has 30 lessons, purchased either 10 at a time or as a complete set at once. Each lesson is broken down into three parts - Grammar, Sentences, and Reading - with a separate video for each. There is one worksheet to complete after each lesson part. Below is an introductory video by the instructor that explains the approach of Visual Latin and also gives you a feel for the instructor's style. Much to my surprise, my reluctant student did not balk when it came time for Latin studies. In fact, I actually heard him refer to various things from his lessons outside of the time spent on it. He started in with an attitude of "Latin is hard", yet gained confidence the more he was in the program. I believe there are several contributing factors to this for our particular student. The lessons are presented in small bites. The video for each part is anywhere from 3 to 8 minutes, perfect for those that tend to have limited attention spans. Similarly, the worksheets are one page for each part. I had my son complete the worksheet immediately after watching the video while the content of the lesson was still fresh in his mind. He wasn't overwhelmed by the writing requirements or length of the worksheets.Furthermore, clear answer sheets are provided for mom. Dwane Thomas has a quirky sense of humor and lots of energy. He is definitely not a stuffy Latin teacher. Stuffy Latin teachers wouldn't dare comment on being a Ninja or use a Snuffleupagus as part of the lesson! Similarly, Dwane Thomas does not present himself as the perfect teacher. He makes mistakes and casually corrects them, sometimes poking fun of himself. This is great if you have a perfectionist at home. Students start reading Latin very early and there are no dreaded charts to memorize. This gives a sense of early success in the program. The video sessions alleviate the requirement of teaching for intimidated moms. In the case of the downloads, they are also extremely portable for watching at home or away. My son preferred to watch on his iPod, even at home. The worksheets aren't lengthy and reference charts are provided in the working space. In the words of my son, "He was really funny, which is why I liked it so much." This program has a ton of wiggly boy appeal. It's efficient. It's funny. It's portable. You can purchase Visual Latin DVDs from Timberdoodle. At the moment, they don't carry the download version, but if you can't wait to get this program, you can purchase the instant Visual Latin download version directly from Visual Latin. 6 FREE Visual Latin Lessons! Disclaimer: As a part of Timberdoodle's Blogger Review Team. I was provided this product free of charge in exchange for my honest review. I have received no other compensation. I strive to give a balanced overview of each product, detailing my opinion of both pros and cons and how the product worked for my family. What works for one family may not work for another. I encourage you to research sufficiently to determine if any product will be a benefit to your homeschool. This review contains affiliate links.